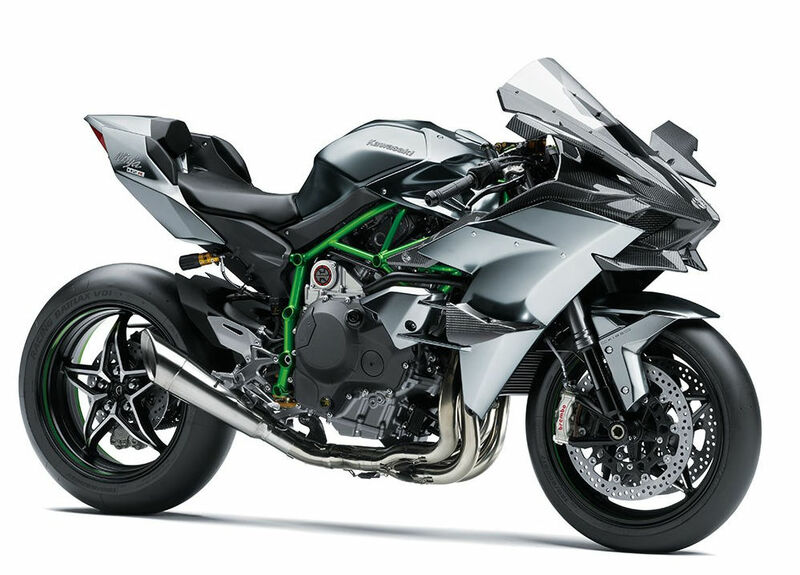 Kawasaki’s awesomely powerful Ninja H2R. Kawasaki is the undisputed leader in production ICE motorcycle performance with the awesome H2R (pictured), which is driven by a uniquely designed supercharged engine. When Kawasaki enters the electric motorcycle space, will it be prepared to maintain its high performance crown? A European patent filing hints at the answer. While the H2R offers an impressive claimed torque peak of more than 120 foot/pounds, electric bikes can certainly exceed this figure, and offer tremendous horsepower numbers at the same time. Two of the problems facing electric bikes, currently, are battery range and cooling. Cooling affects the maximum, safe power output. 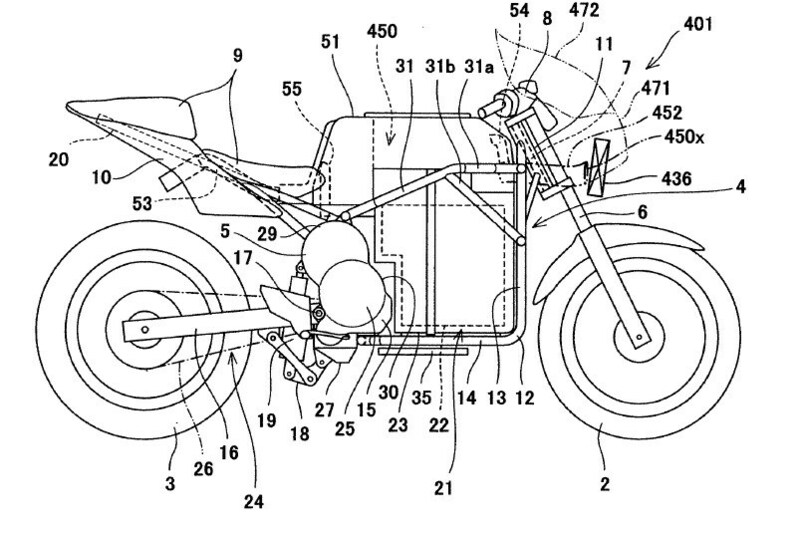 Kawasaki’s patent application addresses the cooling issues with a unique solution. A drawing from Kawasaki’s patent application. Kawasaki proposes to integrate a radiator within the ram air passage leading to the battery case. This radiator will simultaneously achieve two goals, including (1) cooling water or oil that will then circulate to draw heat from the inverter and the electric motor, while (2) serving as a filter “to separate moisture from the ram air moving toward the battery case.” Moisture reaching the battery case can cause all sorts of problems. “A straddle electric vehicle of a sport type intended to attain a high motion capability, is required to provide an output and an instantaneous force which are greater than those of a conventional electric vehicle. Therefore, it is necessary to increase a current supplied to the electric motor. Under the circumstances, the inverter is likely to be cooled insufficiently only by the ram air and the air discharged from the battery case. Accordingly, an object of the present invention is to provide a straddle electric vehicle which is capable of cooling a battery and other electric components with a simple structure and suitably suppressing occurrence of a problem in the battery or the like. It will be interesting to observe how the large Japanese motorcycle OEMs proceed as they introduce production electric motorcycles. When the conversation turns to green energy, one of my favorite quotes is “We didn’t get out of the Stone Age because we ran out of stones”. Meaning that innovations in technology typically lead the way in moving society forward – without development of the transistor, for instance, the “digital age” would have never happened. So should it be with transitioning away from ICE vehicles. When BEV’s become superior to their ICE counterparts, they will be adopted quickly and willingly. And by “superior”, paramount are cost, performance, and reliability. We’re getting closer and closer on cars, but electric motorcycles are still a long way off, IMHO, it’s just a different platform, with different metrics. By the same token, you’re unlikely to see battery-powered cruise ships, trains, passenger jets, steel mills or Minnesota home heating systems for the same reasons, at least until the energy density of batteries goes WAY up from where it is currently. So what’s the hurry on electric motorcycles? It’s not like we’re going to run out of petrol anytime soon, and it’s not like ICE motorcycles play a significant role in global warming. Let the technology mature to the point where e-bikes make sense, and then proceed. But we’re not there yet. We certainly aren’t there when it comes to replacing ICE motorcycles in the capacity they are typically used in North America. High-performance street bikes that can’t go more than 70 miles on a charge when being used on the highway or when taking advantage of their performance? Yeah, I just can’t see much value in that. But I think the race is on in the Asian markets, with Europe possibly soon to follow. For commuter duty, EV motorcycles – scooters particularly – make tons of sense. I was in China recently, and electric scooters and bicycles were everywhere. The electric dirt bike market has good potential here the US in my opinion. That’s where they are getting close for me. Reply function seems to be down….again. The European Union this week passed legislation to fit ALL vehicles sold in the EU (from 2022) with devices that cause vehicles to comply with speed limits. The “black box” will further record parameters that, in the event of an offense being suspected will allow police to extract the data and use it in evidence against you. These devices will contain GPS and together with mass surveillance roadside cameras will record your movements. Removing or tampering with these devices will be a CRIMINAL offense. Any technician who does not report a device that has been disabled or otherwise modified will also be committing a criminal offense. I read that a few hours ago. Even the UK, despite Brexit. Normally I would say it’s time to purchase some old vehicles but the fact is, anything with an OBDE port will be able to be retrofitted with add on equipment. It won’t be long after 2022 where the add-on will be made compulsory to OBDE ported vehicles. With everything it communicates with and does automatically, it’s pointless to be concerned with high HP numbers anymore. As vehicles will have more cameras added for recognizing things inside and outside the vehicles, and V2V comm, other vehicles will recognize what your vehicle is also doing. While I don’t see MCs getting automatic braking and lane keeping control (because those things can cause accidents), I can forsee them getting speed limiting. No reason to not believe every MC will be ride by wire by 2022. Older cable actuated accelerator bikes will likely get phased out 5 years later from ULEZ zones with new requirements for Euro 4 instead of Euro 3. I predict a lot more ULEZ zones will pop up all over the UK. (d) where a cruise control system is engaged, the intelligent speed assistance system must automatically adapt to any lower speed limit. Contrary to the above post, I didn’t see anything anywhere in the legislation about criminal penalties. Maybe I just didn’t see it, but a word search on “criminal,” “penalty,” and “disable” turned up nothing. Here’s the copy of the legislation that I was looking at. Time for actual retro bikes to go up in value.. I hope they sell a lot of them. I will still always think of a motorcycle as a machine that sounds like a motorcycle. circular logic will eventually lead to madness. There is a lot of EV research going on that is well under wraps because the first company to bust loose and address some of the weight, range and safety issues (spontaneous combustion)is only going to have the lead for a short while before other companies let lose with what they have and the innovation and development hits high gear. EV technology is quickly approaching a renaissance point. The era of the ICE has run it’s course, there is no innovation, just new lipstick on the same old pig. EVs are so not ready for prime time as a technology. Kind of getting there but in addition to issues already commented on, there’s the simple fact that if you buy a modern ICE vehicle it’s probably going to last as long as you want to hang on to it. Until this is the case for EVs I’m not interested. And what makes you think an EV won’t last as long as an ICE vehicle? What are you referring to when you imply that an EV won’t last as long as you’d want to keep it? The motor and battery pack are the main difference. An EV motor has far fewer parts and are proven in high-use environments (they drive freight trains, ships, heavy industrial machinery). Batteries would seem to be the major point of failure/expense, but remain for more modular/replaceable than an engine. One of the potential advantages of EVs is the ability to upgrade them rather than replacing entire as they age/better tech is available. When they solve the issues concerning range, cost and charging downtime I’ll be sure to pony up to the counter and lay down my greenbacks for an electric machine that performs better than than the ICE bikes that are available now. Until then I’ll keep my wallet closed and my eyes open for an electric motorcycle that can compete with best of the Superbikes and not just in 30 minute intervals. While certainly impressive from a statistical point of view, two-wheeled power figures like this are about as practical as an electric dog polisher or kerosene-powered turtleneck sweater. Great for “status” and bragging rights, but seldom useful to full potential. What the article doesn’t mention is the weight of an EV bike with this much power/torque. Due to inefficient batteries it will be way heavy compared to an ICE bike with equivalent power figures. “Great for ‘status’ and bragging rights, but seldom useful to full potential”… Are we talking about bar hoppers and poseur Queens? Seriously do you people talk about anything except bar hoppers and poseur Queens? We also talk about tank seams, beaks and the fact that all bikes are too expensive. Yup. What Tank said. Especially the beaks, I hate beaks. And that the gas tank is too small. Bring on the e-motorcycle wars, I’m ready! !